Dr. Payman Danielpour and Dr. John Layke work side by side with every patient who walks through the door. Although Dr. Layke is our nose job specialist, Dr. Danielpour assists in helping patients find their ideal nose shape. Beverly Hills Plastic Surgery Group uses precise, trend-setting technology, equipment and techniques to help you achieve the look you’ve always wanted. * Rhinoplasty (also referred to as nose job or nose surgery) is a delicate procedure and should only be performed by an experienced rhinoplasty plastic surgeon. For women, it is especially important to carefully choose your plastic surgeon because the female face is very delicate and a subtle change can alter your whole appearance. 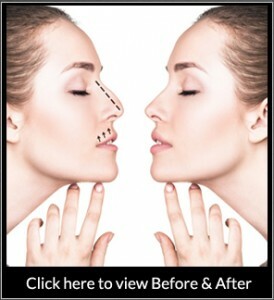 An ideal nose job plastic surgeon will make you feel comfortable and cared for. An ideal plastic surgeon will consult with you and help you decide on realistic, practical goals, creating a plan of action for your aesthetic enhancement ambitions. That’s what we can do for you. Rhinoplasty can help shape a woman’s nose to be more proportionate to other structures of her face. Rhinoplasty can also decrease or reframe nose width, particularly at the bridge. The procedure is also used in order to correct overly large nostrils which can be wide or upturned. Rhinoplasty can even benefit the functionality of your nose, helping you breathe better (septoplasty). Rhinoplasty can help anyone who is unhappy with the shape, size or function of the nose. If you’re a woman in need of rhinoplasty in Beverly Hills, CA or the surrounding communities, then schedule a consultation today and we’ll get to work for you. Why Beverly Hills Plastic Surgery Group? We have two talented and passionate plastic surgeons who work in tandem with every patient. We work closely with you, dedicating ourselves to using cutting-edge techniques and equipment to achieve the look you desire. Because you will have the expertise of two board-certified plastic surgeons, this gives you two different perspectives, which helps increase patient satisfaction and promote an enhanced sense of ease and confidence.